Palo Alto High School’s main gym, built in the 1920s, features a basketball court with six backboards, four of which cling to the railing of the upper-level stands. The school’s smaller gym dates to the 1960s and more closely resembles a community room that happens to have a hardwood floor and some backboards that protrude from its walls. “You simply don’t see gyms … that are that old and functioning at today’s level,” said Bob Golton, facilities and bond program manager for the Palo Alto Unified School District. Soon, you won’t see them at “Paly.” Atop the desks of school administrators rest stacks of schematic designs for replacing the antiquated gyms with a state-of-the-art athletic center by August 2015. According to plans, the main gym’s seating capacity will double from 800 to 1,600. A weight room will command nearly four times the space of the current version. The complex will rise from the same ground where the old structures are located, with an enclosed hallway — accented by a row of arched windows on both sides — connecting two new gyms. The athletic center is designed to wrap around three sides of the school’s outdoor swimming pool. Other features of the main gym: a sunken floor, a “Hall of Fame” corridor and a large lobby featuring a ticket booth, concession stand and athletic store. A training room, a room for visiting coaches and team locker rooms are planned for right off the main gym floor. There will be P.E. lockers for 600 boys and 600 girls. Across the pool from the main gym, the new small gym will include a full-size basketball court and two cross-courts. It will be adjacent to the wrestling/multipurpose room and pool locker rooms. School officials hope to begin demolishing the old gyms as early as June, but must await approval from the Division of the State Architect. In 2008, Palo Alto voters approved a $378 million Strong Schools Bond to assist the district in building and enhancing facilities around its campuses. The district earmarked a small portion of the bond for moderate improvements to Paly’s gyms. That’s when a local donor — the Peery family — stepped in with the vision to give the gyms a complete makeover, and an offer to cover all costs beyond the allotted $5.4 million. While the total donation won’t be determined until construction is finished, school officials expect the Peerys’ contribution to far exceed the amount afforded by the bond. “The donor will not be writing a check to the district, but rather will be paying the contractor and architect,” Golton said. He said the district will use a lease-leaseback project delivery method. Such an arrangement allows school districts to lease property in need of construction improvements to a builder for as little as $1 per year without engaging in a public bidding process. School officials have taken steps in hopes of mitigating disruption to student activities while construction is underway. As far as finding a place for its displaced sports teams, Paly might not have to look any farther than the other side of El Camino Real. Golton said the school is in the process of securing sufficient gym time at Stanford to accommodate practices and games for freshman, JV and varsity teams during the 2014/2015 season. While arrangements have yet to be finalized, Paly plans to pay Stanford for the use of its facilities. The schools are no stranger to partnerships. 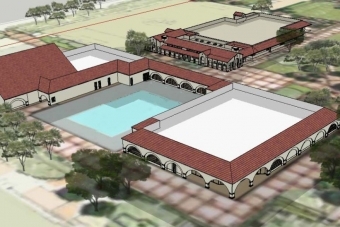 According to Golton, Paly swimmers used Stanford’s aquatic facility during construction of the high school’s pool in 2005/2006, and Stanford has used the high school’s football field for practices. Hodges said the school also aims to repurpose some of the spaces on campus to accommodate activities displaced by the construction (such as moving dance into the student center); transform existing portables into team rooms and teacher offices; and import portable locker rooms and restrooms for the P.E. classes. The school is looking to install a tent structure near the stadium’s concession building to shelter P.E. classes on rainy days. The initial plan was to maintain pool operations throughout the construction, but Hodges said that likely will not be the case. He acknowledged that it will prove challenging enough to avoid damage to the pool while razing the surrounding buildings. The school is pursuing an interim aquatic facility. At the end of the process, the campus will sport vastly improved athletic facilities, which Paly officials see as a community asset. Golton said the school intends to make the complex available to the community when not being used during the school day. This story originally appeared on the Peninsula Press . Benjamin Custer covers education for the Peninsula Press. 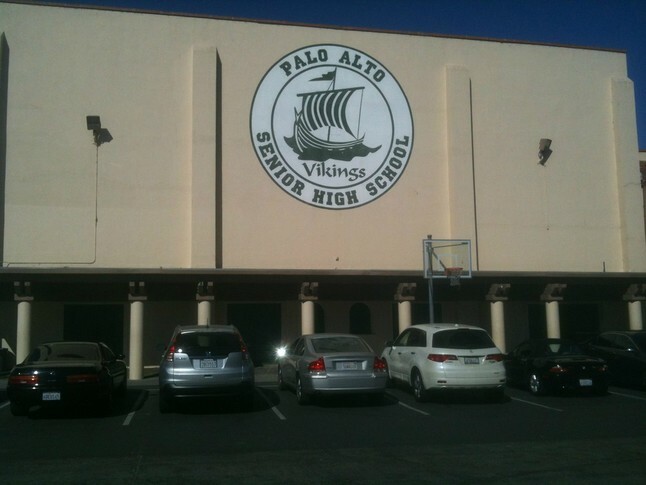 An anonymous donor is offering to give the Palo Alto Unified School District up to $20 million to rebuild the outdated indoor athletic facilities at Palo Alto High School, District Officials revealed this week. The unprecedented gift was greeted enthusiastically by trustees at Tuesday night's Board Meeting. "We are incredibly lucky to have a community that cares as much about our schools and our facilities as much as our community does," said Board Member, Melissa Baten-Caswell. Although the small and main gymnasiums at Paly are in need of replacement, they were not among the projects that made the cut to receive funding from a $378 million bond measure passed by district voters in 2008. "It's in our plans, but it is far out in our plans," Baten-Caswell said. "We would have to do some more bonds beyond where we are today in our plans. This would speed that up dramatically." The anonymous donor is a parent of a student in the district and his extended family has a long history of community involvement and philanthropy according to a report prepared by Bob Golton, the District's Bond Program Manager. Under a plan the District is developing with the donor, the $20 million would be combined with $5.47 million in bond funds that have been allocated for a new weight room at Paly, Golton said. The donor would then work with an architect and construction company to build new gymnasiums as well as a wrestling room, dance studio, weight room and classrooms. The donor envisions constructing facilities that are on par with the ones at Menlo School, a private school in Atherton according to Golton's report. District officials will discuss the project with various school groups in the coming weeks and a community meeting has been tentatively scheduled for Feb. 21. The Board is expected to review conceptual designs at its March 12th meeting and take a vote on March 26. "Provided the designs pass muster, construction on the indoor athletic facilities could start as soon as May 2014," Golton said. The project is expected to take about a year to complete. The new facilities would be roomier than the existing ones. According to a chart shown at Tuesday's meeting, Paly would gain 15,085 sq feet for a total of nearly 38,900 sq feet. The private gift would also keep Paly on par with Gunn High School which received bond funding for a second gymnasium. Gunn will eventually boast roughly 36,215 square feet of indoor athletic facilities. "Along with the students, the community stands to benefit from the larger facilities," Paly officials said. "In any given week, we're contacted by anywhere from 5 to 10 organizations that are looking to book a field or gymnasium and we have to say, 'No' " said Assistant Principal, Kimberly Diorio. "I think this has a huge impact on the entire community, because we'll be able to offer more times during the day, on weekends and nights when we can make these spaces available."